Kelly Meister-Yetter is a writer, public speaker, photographer, potter and animal activist. As a childhood sexual abuse survivor, Kelly draws on her personal experiences to talk about recovering from sexual abuse, and developing strategies for living with depression. Based on her years of experience rescuing animals in need, and volunteering her time to animal welfare agencies, Kelly also acts as an advocate for their care and humane treatment. In addition, she enjoys speaking about how animals can help your healing process. Kelly is also available for jury consultation in animal cruelty cases. If you would like to have Kelly speak to your group, conference or seminar, please contact her by email. Whether she’s herding her pet ducks around the yard or splashing through puddles to show her fearful horse how it’s done, in Sorry Honey, But The Critters Come First, Kelly Meister-Yetter embraces her many animal responsibilities with a level of enthusiasm that would exhaust most folks. In this third installment of her popular critter-themed memoirs, Kelly takes the reader along on new adventures as she continues to find herself in one improbable situation after another. No matter what she’s doing, though, Meister-Yetter throws herself wholeheartedly into every encounter with every animal she meets, be it cat, dog, duck, opossum, raccoon, skunk, or horse. And it’s a safe bet that she’s having more fun than you can imagine! No Better Medicine will make you laugh, cry, and wish that you were having this much fun! 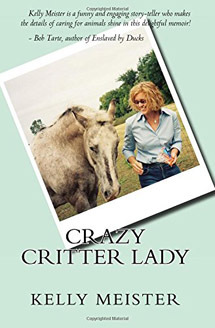 Kelly Meister's book, Crazy Critter Lady, is a memoir that details her relationships with creatures great and small. 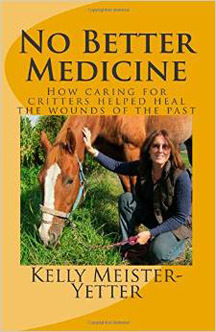 From friendship with a gang of flightless abandoned ducks to dealing with Spanky the cat's low self-esteem, to life lessons taught by an aged horse, Kelly takes the reader on an emotional roller coaster ride as she explores the healing power of the animals around her. Crazy Critter Lady is also available at Barnes & Noble. Buy the book in e-form here!